We offer Stand Up Paddleboarding (SUP'ing) to individuals, Stag and Hen groups, School groups and Summer Holiday adventure SUP Days. Whichever course you choose you'll be guaranteed a safe and friendly introduction to SUP within the sheltered confines of the Cattewater Harbour. We provide an ever-popular 2-hour "TrySUP" taster session, this session includes everything you need to get afloat - wetsuits, all SUP equipment, access to facilities (hot shower for after the session!) and full instruction throughout. If you have completed one of our TrySUP sessions and would be interested in paddling further afield then join one of our 3 hour SUP Tours as we explore the local waters in small groups. 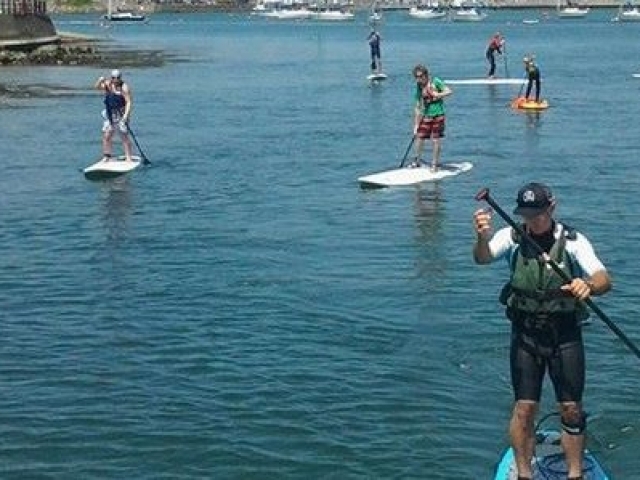 One of the most magical things to do in Plymouth is to join one of our Breakfast Paddles and experience SUP'ing the calm morning waters of Britain's Ocean City. After your early morning exercise we'll SUP back to the centre for a well-earned breakfast roll and hot drink. We have an extensive programme of tasters, tours and breakfast paddles throughout the year, but if you can't make of any of our scheduled dates we can provide these sessions on a bespoke basis to groups of 4 or more people. Minimum age 11 years for all SUP tasters and breakfast paddles, and 16 years for SUP tours. For young people looking to TrySUP during the school holidays we provide a SUP adventure day for ages 11 - 16 years. It's a slightly shorter day from 09.00 - 15.00, but still includes a packed lunch and everything needed to get afloat. Participants will have a SUP-er time using both single and multi-person boards, a SUP journey and plenty of skills and games too! 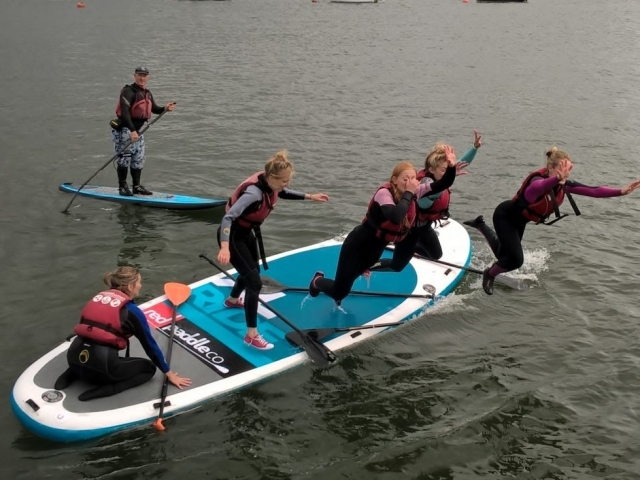 School Groups can also experience the enjoyment of SUP as-we provide half day sessions in paddleboarding using both single and giant 17-foot multi-person boards. Minimum age for paddleboarding using single boards is 11 years and for multi-person boards 8 years. Please contact the centre directly to add SUP to your school enrichment activity. 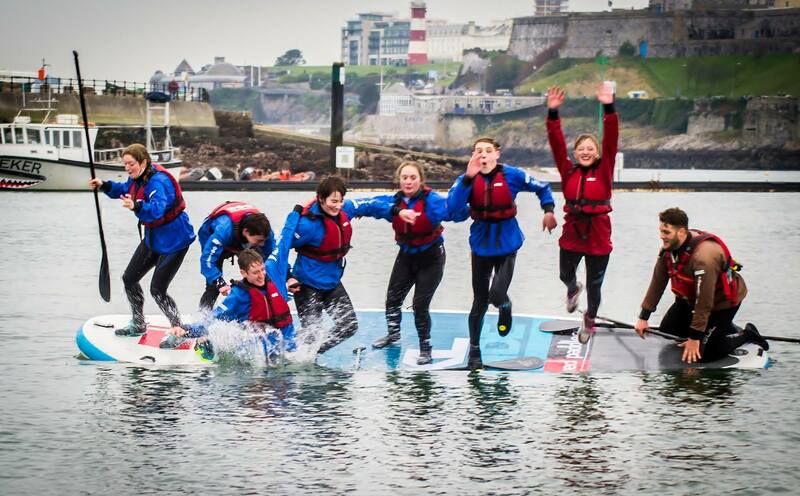 The Mount Batten Centre provides British Canoeing SUP Courses including the Discipline Support Module (DSM) for Stand up Paddlboarding and the Stand up Paddleboard Sheltered Water award. The 6 hour DSM aims to provide an overview of SUP and the fundamental techniques and skills for coaching SUP. This course is recommended for existing paddlesports coaches interest in pursuing SUP and developing coaching/analysis skills specific to SUP. The sheltered water award develops your understanding and of how to plan and paddle a SUP in sheltered water, using the appropriate abilities and decision making skills to travel safely on your pre-determined route. 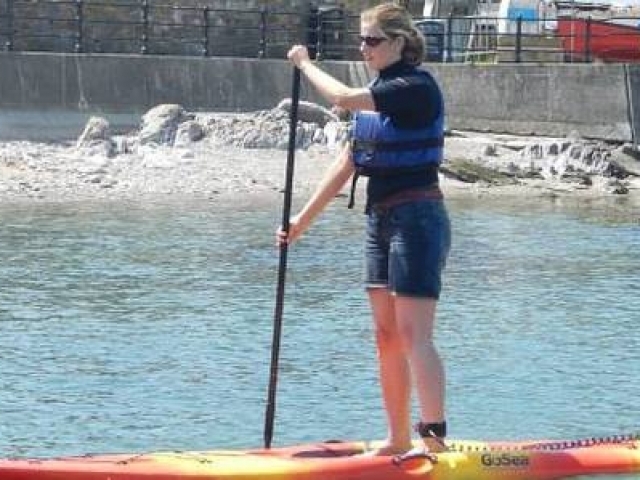 Five great reasons to try Stand Up Paddleboarding at the Mount Batten Centre! Stand Up Paddleboarding is great fun! You can have a SUPer time on the water on your own, with your friends or family - just look at the smiles on the faces of our SUP-ers! Stand Up Paddleboarding is an excellent way to exercise! Who needs a boring gym when you can get out on the water, in the fresh air, and work on your core muscles and your balance and co-ordination all at the same time? See Plymouth and the surrounding coastline from a SUPer different perspective! 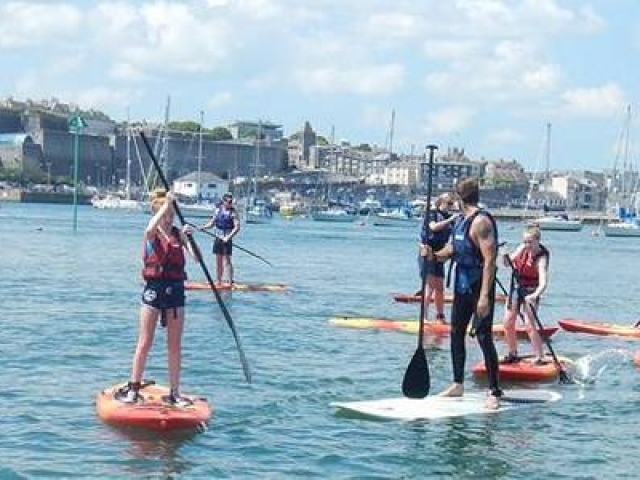 Stand Up Paddleboarding at Mount Batten Centre lets you experience the sights and sounds of Plymouth Sound from an entirely different viewpoint! Wetsuit - check! Paddleboard - check! When you try Stand Up Paddleboarding all you need to do is turn up and we'll do the rest! OK so we can't promise your first SUP session will be relaxing - but it will be a laugh (and all in a controlled, safe environment) but once you've got the hang of it, gliding through the water on your Stand Up Paddleboard is relaxing - put the stresses of the office, classroom, exams behind you! Minimum Age 11 years.